These striking little brachiopods are gifts from Clive Champion, a generous Englishman with whom I occasionally exchange packets of fossils. In January I received a surprise box with lots of delicious little brachs, including the two shown above. I remember this type well from a field trip I had to the Upper Cretaceous of The Netherlands. Here we see the reverse sides of the shells at the top. 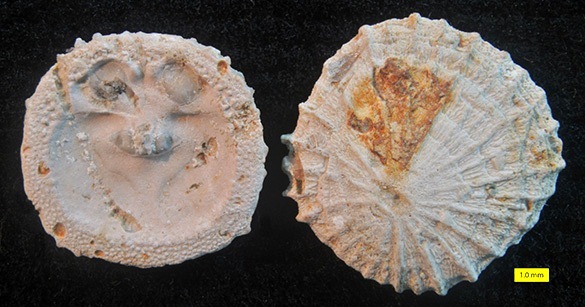 These are most likely dorsal valves of Isocrania costata Sowerby, 1823, from the Lichtenberg Horizon, Upper Maastrichtian (Upper Cretaceous) of the ENCI Quarry near Maastricht, The Netherlands. It is possible they are the closely-related species Isocrania sendeni Simon, 2007, but we don’t have enough material to sort this out. 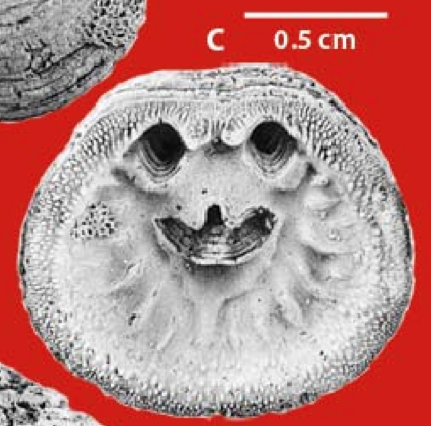 Craniid brachiopods usually live out their lives attached to hard substrates, as with this Ordovician example. 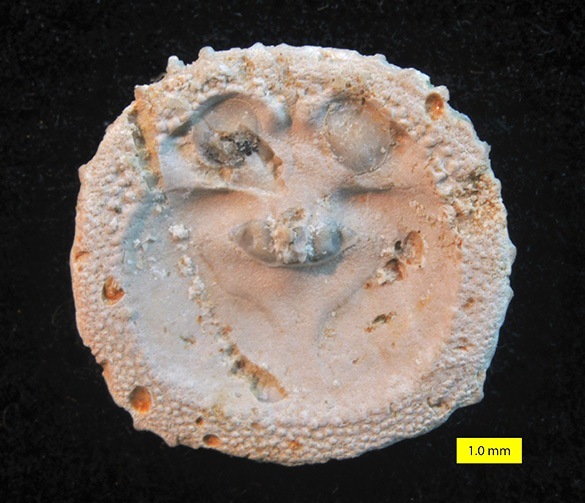 This species of Isocrania, however, was only attached to shelly debris on the seafloor for a short time, outgrowing its substrate early and then living free in the chalky sediment. The above reconstruction image is Figure 2 from Surlyk (1973). Thanks for starting us on this trip with your gift, Clive! Emig, C. 2009. Nummulus brattenburgensis and Crania craniolaris (Brachiopoda, Craniidae). Carnets de Géologie/Notebooks on Geology, Brest, Article, 8. Hansen, T., and Surlyk, F. 2014. Marine macrofossil communities in the uppermost Maastrichtian chalk of Stevns Klint, Denmark. Palaeogeography, Palaeoclimatology, Palaeoecology 399: 323-344. Simon, E. 2007. A new Late Maastrichtian species of Isocrania (Brachiopoda, Craniidae) from The Netherlands and Belgium. Bulletin de l’Institut royal des Sciences naturelles de Belgique, Sciences de la Terre 77: 141-157. Surlyk, F. 1973. 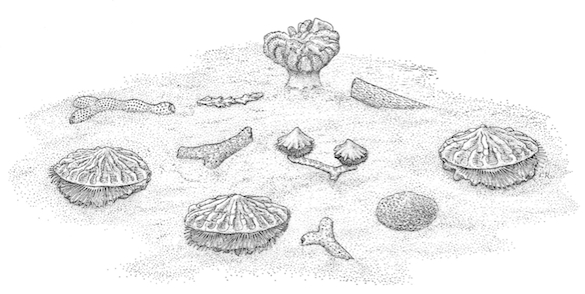 Autecology and taxonomy of two Upper Cretaceous craniacean brachiopods. Bulletin of the Geological Society of Denmark 22: 219-242.